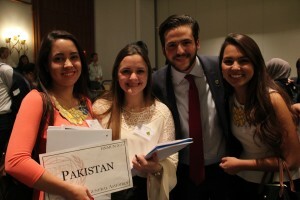 Delegates representing Bangladesh and Pakistan are all smiles in committee. In the wake international debate over freedom of speech and freedom of expression just weeks after the attacks on French satirical magazine Charlie Hebdo, the Social, Cultural and Humanitarian Committee (SOCHUM) met to discuss journalistic freedoms and protections at the Harvard National Model United Nations. With various countries and a vast array of opinions represented, the committee worked quickly and diligently to address some of the issues that plague journalists in the international community today. Cyprus, working with delegates from Papua New Guinea and Montenegro, hoped that the committee could come to an agreement to have general rules regarding journalists. Other delegates and blocs had similar opinions, and sought to have the global community as a whole create regulations for journalists crossing borders. Because of the variety in countries, governments and regions represented, the committee was split into two general sides regarding journalistic freedoms. According to the non-governmental organization Freedom House, only one in seven people live in a country with a “free” press, and the last year has seen decline in free press around the globe. Freedom House accredited such regression to setbacks in Middle Eastern and East African states, as well as marked deterioration in the United States. 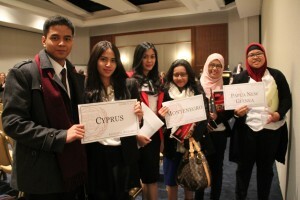 Delegates from Cyprus, Montenegro and Papua New Guinea take a break during an unmoderated caucus. “There are those who are in favor of freedom of expression, and those who are much more restrictive,” the delegate from Bangladesh said. In alliance with delegates from Pakistan, Malta and Armenia, Bangladesh emphasized to the committee the importance of training and education for journalists. Education was a highly-stressed topic in all of the blocs within the committee, with various working papers implementing educational and training measures and methods for journalists and reporters. Panama, working with Turkey, Spain, the United Kingdom, the Russian Federation and Qatar, was beginning to draft a resolution which divided many of the topic’s issues into the categories of security, access, education and the definition of freedom. Panama’s working paper hoped to create UN immersion centers which could serve as safe havens for journalists and could train those journalists about security.